Pulte offers 23 floor plans in the village of Reverence on the north end of the community. Reverence, developed exclusively by Pulte Homes, features a beautiful natural setting created by the topography of the area. Pulte Homes, a 65-year-old nationwide homebuilding company and one of the country’s largest, has a long track record of building more than 30 neighborhoods and thousands of homes in the master-planned community of Summerlin. Currently, Pulte offers 23 floor plans in the village of Reverence on the north end of the community. Reverence, developed exclusively by Pulte Homes, features a beautiful natural setting created by the topography of the area. At the recent Southern Nevada Home Builders Association Silver Nugget awards, Reverence took home top honors as the 2018 Community of the Year. Several Reverence models, including Kingsgate, La Vista and Sterling, were also recognized with Silver Nugget awards for outstanding design. Last weekend, residents and prospective residents of Reverence celebrated the completion of their community’s new clubhouse. 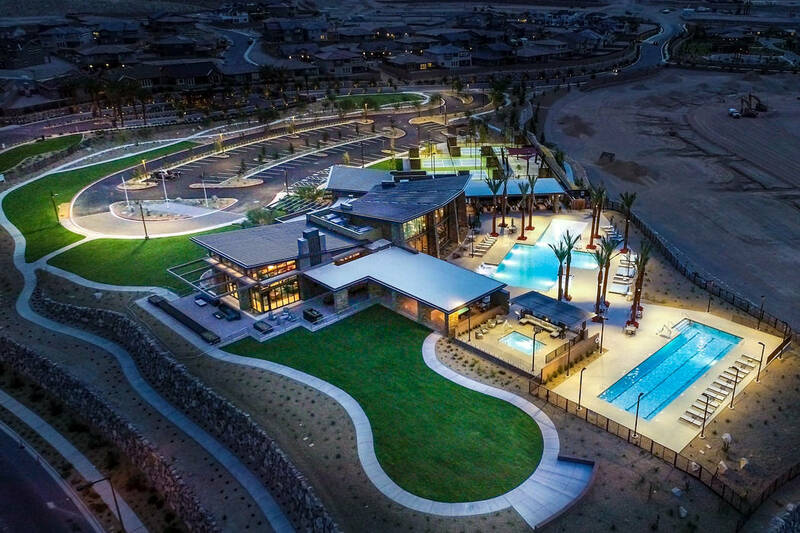 Spanning 16,000 feet of indoor/outdoor space, The Clubhouse at Reverence features a resort pool with beach entry, wet deck and volleyball; lap pool and spa; state-of-the-art fitness center, pickleball courts and a variety of gathering places perfect for socializing and entertaining. These include great room, multipurpose/aerobics room; outdoor terrace and outdoor activity area with ping pong and billiards, exterior dining and event lawn. The Clubhouse is accessible to residents within the guard gate. Summerlin’s northernmost village, Reverence, floor plans throughout six collections of homes built exclusively by Pulte Homes. Ten models are now open for viewing. Located on 300 elevated acres west of the 215 Beltway, Reverence is nestled along the base of the mountains and bounded by West Lake Mead Boulevard on the south and Cheyenne Avenue on the north. Over 270 homes have sold at Reverence since the village opened in Summerlin just over a year ago. Floor plans at Reverence embody a range of transitional and contemporary designs inspired by craftsman, prairie, hacienda, farmhouse and desert contemporary styles. Two collections, ideal for young families, move-up buyers and empty nesters, offer single- and two-story floor plans ranging from 1,579 square feet to more than 2,806 square feet. These homes are priced from the high $300,000s. Four collections, designed for families, upscale empty nesters, as well as those seeking the ultimate second home in Las Vegas, are behind a guard gate. These homes, priced from the $500,000s, offer a luxury lifestyle and range from 2,156 square feet to 4,815 square feet in single- and two-story floor plans, including estate homes. All Reverence residents enjoy miles of walking trails, an 8-acre park that includes an amphitheater, walking track and volleyball, basketball and tennis courts. Pulte keeps consumers top of mind when designing such features as ample storage and large living spaces. Its homes include industry-leading home warranties with a focus on energy efficiency via such elements as tankless water heaters, Energy Star appliances, Low-e windows and High SEER HVAC systems that combine to earn Pulte-built homes superior quality. No matter where you live in Summerlin, residents enjoy access to all the community offers: more than 250 parks and open spaces, 150-plus miles of interconnected trails, 10 golf courses, more than two dozen public, private and charter schools and the Downtown Summerlin area offering fashion, dining and entertainment; Red Rock Resort; City National Arena — practice facility and home of the Vegas Golden Knights; and coming soon, Las Vegas Ballpark, a AAA- baseball stadium and future home of the Las Vegas 51s. For more information on new homes in Summerlin, including more than 30 actively selling neighborhoods, visit www.Summerlin.com.